Bridgette and I had an overnight stay at the Premier Inn in Bath Road near Heathrow before commencing a return to Costa Rica. We flew with Continental to Houston and then on to San José. I heard a Skylark singing from the Inn car park and then saw one in song flight from the plane between the runways. Nice to see a decreasing farm bird adapting to new pastures. We arrived at Houston at 3pm after a 10 hour flight, where it was cloudy but warm. As we taxied to the gate a ringtail Northern Harrier was quartering the grasslands between the runways. The change here was that the U.S. Department of Homeland Security had put in a queue for travellers heading for connecting flights out of the U.S.A. and as a result we were through to our departure gate in 30 minutes, a new record after the near two hours last year. I did see a distant Vulture sp, either Black or Turkey and two Feral Pigeons. Then it was back onboard for the 3½ hour flight on to Costa Rica. We arrived in darkness at around 8:40pm. Our driver supplied by the ever-efficient Costa Rica Gateway was waiting to take us to the Hotel Bougainvillea where we had stayed last year. We were met by the same manager who efficiently installed us in our room. Despite being tired and having the prospect of a 6:40am pick-up, I insisted we went to the bar before it shut where I reacquainted myself with an ice-cold Imperial beer before bed. Even though we had an early start I was determined to get an hours birding in the hotel’s enclosed gardens before we hit the road for Mawamba Lodge on the Caribbean coast. My alarm was set for 5am, but because of the time difference I was already awake. From the balcony I could hear an unidentified distant owl calling whilst I drank a coffee. I descended to the gardens at 5:30am just as the sun came up. The first bird was the first of many Clay-coloured Robins, the ubiquitous national bird. I only managed a dozen species, but it was nice to reacquaint myself with Rufous-tailed Hummingbirds, Rufous-collared Sparrows, attractive Blue-grey Tanagers and a stunning Blue-crowned Motmot and a couple of pairs of Vaux’s Swifts were overhead. I collected the luggage with Bridgette and we were soon checking out and into a minibus for a short journey, where we transferred to a larger coach and met Jorge, our guide for Mawamba Lodge. We set off along the Braulio Carillo Highway through the National Park, with an interesting running commentary from Jorge. After about an hour and a half we arrived at Río Danta Restaurant where breakfast awaited us. As is often the case it was a buffet breakfast, so we ate well and were certainly ready for it. From the covered al fresco dining area I could see Black and Turkey Vultures circling in a cobalt blue sky and a Great Kiskadee called from a nearby bush. After breakfast we still had about 20 minutes to kill so I went along a riverside trail and immediately found the first new bird of the trip. A couple of MONTEZUMA OROPENDOLAS were displaying in the trees. This involved an unmistakable call given at the same time as swinging upside down on the branch with wings outstretched. It was a crow-sized bird, maroon in colour with a banana yellow tail. Also a Social Flycatcher was in these trees. Then it was back on the bus and we pushed on stopping at Guapiles where Jorge had a THREE-TOED SLOTH staked out right by the main road in a tall tree. It showed amazingly well and we watched it for a ¼ of an hour. Video here. Travelling on we stopped again for a break at Siquirres. Jorge, a keen birder, and I watched three Northern Rough-winged Swallows over the field opposite the café and a Montezuma Oropendola flew over. Then we drove on to a working banana plantation at Caño Blanco. Here the locals were selling coconuts, where you could drink the milk first and then they would open them so you could eat the flesh. They were also showing off huge HERCULES BEETLES. Again I wandered off birding, a male House Sparrow was a Costa Rica tick, then I found a pair of PASSERINI’S TANAGERS, the male jet black with a vivid red back/rump. I also found another female, a Tropical Kingbird and a Rufous-tailed Hummingbird. Then it was back on the bus for the short drive to Caño Blanco dock but not before stopping at a roadside cottage where two local women were selling sweet and savoury snacks, Bridgette had something sweet but I had an enchilada, which was still burning my mouth an hour later. Two Northern Jacanas were in a field just before the dock. At the dock we had cold drinks whilst waiting to transfer to the two Mawamba Lodge boats for the 1½ hour transfer through the canals. There is no road access. Birds around the dock included a pair of Ruddy Ground-Doves, a Green Heron and a few Mangrove Swallows. My thought that the boat journey would be a relaxing trip along the canals, birding along the way, was shattered once we got aboard and it was more pedal to the metal and aquaplaning all the way at top speed. Nevertheless there were birds all seen briefly – six Black-necked Stilts, nine Snowy Egrets, two Northern Rough-winged Swallows, four Montezuma Oropendolas, two flocks of Royal Terns totalling 140+ birds, four Neotropic Cormorants, a Great Kiskadee, six Cattle Egrets, an Anhinga, two Little Blue Herons, a Tricolored Heron and two Great Egrets. We did slow up for close looks at another Three-toed Sloth and two large American Crocodiles. Arriving at the Lodge we were greeted on the dock with a glass of fruit punch before being allocated rooms. After dumping our bags we went straight for lunch, again a buffet with an excellent choice. A BLACK-STRIPED SPARROW in the grounds was a lifer. I was also pleased to photograph a POINTER SISTER butterfly (Adelpha iphiclus), one of the few that actually sat still and posed. After lunch we crossed the canal by boat to the Lodge’s private rainforest reserve. There was a boardwalk through the forest and Jorge gave us an interesting guided walk. As is often the case with rainforest we didn’t see many birds. A SLATY-TAILED TROGON was sat very high up in a huge tree, but we saw this species much better in the following days, I found a Black-and-white Warbler, one of my favourite American warblers, a Squirrel Cuckoo was seen well and a BAY WREN sang from deep cover, which was very frustrating as it would have been a lifer. Other wildlife included a tiny STRAWBERRY POISON DART FROG, known locally as Blue-Jeans Frog, four MANTLED HOWLER MONKEYS and two Black-handed Spider Monkeys (of the reddish subspecies). After the walk we took the boat back to the traditional Caribbean village of Tortuguero, where we were given an hour to explore, before walking back to the lodge along the beach. In the village a male BLACK-COWLED ORIOLE was a lifer and hundreds of GREEN PAGE MOTHS were continuously passing through on migration, and on the walk home along the beach Hudsonian Whimbrel, six Magnificent Frigatebirds and seven Brown Pelicans were new for the holiday. I was up at 5am so I could get a bit of birding in before we joined the 6am riverboat trip. I saw mainly common birds but Eastern Kingbird was new for the trip. Just about all the party got out of bed for the early trip. It was excellent, the weather was beautiful and the birds kept coming. I had five lifers, the first found by Bridgette, a beautiful SUNGREBE, but only seen by our boat, a PALE-BILLED WOODPECKER, a SEMI-PLUMBEOUS HAWK flew over, a GREEN IBIS perched up and showing well and finally one of my most wanted birds a GREAT POTOO incubating an egg on an overhanging branch. Other new birds for the trip included Spotted Sandpiper, Red-lored Parrots, Ringed Kingfisher, Bare-throated Tiger Heron, Chimney Swift, Keel-billed Toucan and Great Blue Heron. Other wildlife included three species of monkey White-faced Capuchin, Black-handed Spider Monkey and Mantled Howler, a SPECTACLED CAIMAN, a Common Basilisk, a Green Iguana and finally a bright yellow EYELASH VIPER, which the boatman pulled the boat alongside much to the horror of Bridgette. WATER BACHIRA flowers were also impressive and new for us. After a very successful boat trip we returned for breakfast after which Jorge gave us a tour of the grounds showing us the plants and wildlife. A BRONZY HERMIT hummingbird was a lifer and Chestnut-sided Warbler, Variable Seedeater, Common Tody-Flycatcher and Baltimore Oriole were new for the trip. 6+ CARMINE SKIMMERS were around one of the ponds and Green Page moths were still passing in their hundreds. We also had good views of a female Slaty-tailed Trogon, a pair of Black-cowled Orioles at a nest stitched to the underside of a palm leaf and we saw six roosting BRAZILIAN LONG-NOSED BATS and three CENTRAL AMERICAN WHIP-TAIL LIZARDS. They also had an on-site unenclosed facility for breeding endangered tree frogs, which were free to come and go as they please but were there in numbers as the habitat was perfect. RED-EYED TREE FROGS were a lifer, one of the flagship species for Costa Rica. We heard tree frogs every night but were very difficult to actually locate. Lunch followed the tour then there was another optional boat trip out along the canals. As a Jaguar had recently been seen swimming across a canal we thought it would be better than sitting by the pool. To be honest the afternoon trip was not as good as the morning but we still had some nice birds. Bare-throated Tiger Herons showed well, as did a male Slaty-tailed Trogon, a female Summer Tanager was a new trip bird, another Semi-plumbeous Hawk was seen and the first Osprey of the trip. We saw a party of ten Mantled Howlers and a RIVER OTTER, not quite a Jaguar but very nice anyway. There was a night walk at 5:30pm in the private rainforest but only Bridgette and I went with Jorge and his girlfriend. It was interesting but the bulk of the nightlife were bugs most of which wanted to eat us. Jorge did warn us that the bugs here turned up with knives and forks. A Common Black-Hawk was calling deep in the forest and as it got dark a CRESTED OWL started calling as did a Great Potoo. Unfortunately we couldn’t see either, which was a shame as the owl would have been a lifer. We did see a huge Cane Toad and a couple of Strawberry Poison Dart Frogs. We returned in time for dinner then we turned in fairly early after a long, tiring day. Two House Geckos were on the outer walls of our room. Today was the first day with nothing organised so we decided to have a lazy day around the grounds. I went for my usual early morning stroll and had two lifers, a YELLOW-BELLIED ELAENIA and a pair of SHORT-BILLED PIGEONS, the other notable bird was a Northern Waterthrush, which showed very well. On the way to breakfast we checked the frog area and found a MEXICAN TREE FROG, a NORTHERN BARRED WOODCREEPER showed well on a palm tree there and the male Black-cowled Oriole was at the nest with a very active Common Tody-Flycatcher nearby. After breakfast during a tropical monsoon we sat and photographed birds on the bird tables around the restaurant, notably a Summer Tanager and many of the ubiquitous Blue-grey Tanagers. When the rain stopped we walked through the grounds again, Bridgette went off to take photos of frogs and I lucked into a nice little flock of birds near the river. This included a Lesser Greenlet, a YELLOW-BELLIED FLYCATCHER and a male WHITE-WINGED BECARD. Bridgette rejoined me and we could hear firecracker-like noises coming from the undergrowth. It took me a while to realise that they were WHITE-COLLARED MANAKINS, there was a male and female, with the male displaying, we could see it on and off briefly. Further into the forest we found another 2+ males displaying later on a second walk, one showed very well. Returning to our room a Chestnut-mandibled Toucan was pointed out to us by other guests. It was showing very well in a tree top. After lunch five Sanderlings on the beach and a fine Yellow-throated Warbler were new for the holiday. Today was moving day so it would be a long one involving boat, coach and taxi. In spite of that I was still up at dawn and out birding trying to eke a couple of last ticks from the Caribbean coast. This morning 37 Sanderlings were on the beach, I found my second Yellow-bellied Flycatcher and a Hercules Beetle was in the garden. I walked the green road between the lodge and the beach, but didn’t see much, although I heard 3+ White-Collared Manakins cracking in the forest but remaining unseen. Then 10+ OLIVE-THROATED PARAKEETS flew over landing long enough for me to make a positive i/d. I also found a pair of PALE-VENTED PIGEONS in the garden, my second lifer of the day. After breakfast we said our goodbyes and got on the boat back to Caño Blanco dock. As we set out, before the throttles went on, 150+ Royal Terns were on the small islet and 15+ SOUTHERN ROUGH-WINGED SWALLOWS were flying around, my third lifer of the day. The usual waterbirds were seen on the return although we did slow down to see three Mantled Howlers on overhanging branches. We had a short wait at the dock for the coach to the Río Danta Restaurant. A few birds were around the best being a Bronzy Hermit, a hummer. We were pleased to get out of the heat and board the air-conditioned coach for the onward journey. There were many flycatchers on the wires going through the banana plantation and some would surely have been lifers had we stopped. An unfortunate incident in the middle of the plantation did give me a lifer though. From the depths of the plantation someone or something hurled a rock which crazed part of the coach’s windscreen at the top. We stopped and whilst the driver searched for the source of the attack I spotted a GRAY-HEADED PIPRITES in a well-vegetated ditch. As soon as we got rolling again, with no culprit found, we saw two Groove-billed Anis beside the road. We arrived at the Río Danta Restaurant late because of the delay, but we still had time to enjoy a nice buffet lunch, our taxi driver to Arenal was waiting to take us onward but was quite happy to wait. We saw few birds on the onward journey but just enjoyed the views. Two Wood Storks at Aguas Zarcas were new for the holiday. We were told, to our disappointment, that Mount Arenal hadn’t been active for about four months so we wouldn’t be seeing or feeling any effects of volcanic activity. Eventually Mount Arenal came into view and we stopped for a photo opportunity, the weather had been warm and sunny for many days but that was about to change, so it was as well we did. As we turned off the main highway our driver warned us that for the next mile or so, up to Arenal Observatory Lodge where we were staying, we were about to get a “Costa Rican massage”. Visions of a lovely masseuse arriving were soon dispelled by a real bone-shaking ride up to the Lodge only broken by a quick stop whilst we were shown two CRESTED GUANS roosting in a tree. We checked in at the lodge just before dusk and were pleased to find that we had been allocated Room 29, the best room in the Lodge. Not only did it overlook the volcano straight ahead, but to the left we had great views of the lake and overlooked the bird feeders and it was just a few paces from the restaurant. We went to the restaurant and had a lovely meal and a couple of drinks before falling in to bed early, exhausted. I awoke before dawn, made a coffee and stepped out onto the balcony, the sounds of the forest were wonderful, Howler Monkeys were calling loudly as they were most mornings. As it got light the first of many Clay-coloured Robins appeared on the lawn and many Montezuma Oropendolas flew in to the bird feeders, video here. I gathered my kit and the local map and headed out onto the trails. I had just started to descend the forest trail towards the waterfall when it started to rain heavily, showers continued like this throughout the day but in between it was warm although cloudy. Within a few yards I found a Wood Thrush on the trail in front of me, a super bird but much too dark for photos. As I neared the waterfall I spotted two small birds scratching around in the undergrowth. They were DULL-MANTLED ANTBIRDS, my first antbird species. After photographing the waterfall I took the trail through the forest where I saw two MONTANE SQUIRRELS in the undergrowth close to the path. The path led to the Danta Bridge across a small ravine, here a male CRIMSON-COLLARED TANAGER was singing, a stunning bird. I crossed the bridge and sheltered from the rain under a shelter. A male Baltimore Oriole was singing from a close tree and Sulphur-bellied Flycatcher and Brown Jay were new for the holiday. I re-crossed the bridge and added a pair of Buff-rumped Warblers and a White-throated Robin (not the same as the European species) to the holiday list, a VIOLET-HEADED HUMMINGBIRD was a lifer, my 1000th World species. As I descended the path back towards the Lodge I could hear something braying like a donkey, the “donkey” eventually flew out of the forest, it was a Crested Guan. A Chestnut-mandibled Toucan showed well where the track rejoined the road for the lodge and after a bit of patience with a skulking bird it revealed itself to be a beautiful GOLDEN-HOODED TANAGER. Arriving back for breakfast I received bad news from Bridgette, whilst I was out a WHITE HAWK flew down the valley, seen by her and all the photographers on the deck. I was gutted, it was one of my most-wanted and remains so, as we didn’t see it again or another. However on the plus side two BLACK-CHEEKED WOODPECKERS, video here and a male GREEN HONEYCREEPER on the feeders below our room were lifers. As it was raining, after breakfast, we sat on our sheltered balcony and watched the feeders and the skies above the valley. On the feeders a pair of Red-legged Honeycreepers, two Bananaquits and a Tennessee Warbler were new for the holiday. Overhead a Swallow-tailed Kite was lovely to see, although not as nice as a returning White Hawk would have been. Finally as the rain eased a pair of BAY-HEADED TANAGERS flew in to feed and two White-tailed Coatis foraged below the feeders on dropped fruit. Gathering our kit we headed out to explore, we went to the waterfall first where Bridgette took photos and I found a small flock of feeding birds in a huge Ficus. Two male BLACK-AND-YELLOW TANAGERS were stunning lifers. We moved back up the path towards Danta Bridge and found another small flock of birds which included a female WHITE-LINED TANAGER, a Spotted Woodcreeper and three male TAWNY-CAPPED EUPHONIAS. Across the bridge we walked down into more open country with a couple of farms. On fences beside the road were several Southern Rough-winged Swallows, a male Black-cowled Oriole, a Black Phoebe and a TROPICAL PEWEE. In the valley below I could see a gathering of Black Vultures and one Turkey Vulture on the ground in a ditch, then a Coyote came down the valley and disappeared into the ditch. When we got nearer the Coyote had magically vanished into thin air. We returned for lunch and sat in the windows with spectacular views of the volcano, the valley and the lake below – the peak was cloud covered though. An Orange-bellied Trogon was spotted sat in a bush near the feeders and four Spider Monkeys swung by. We idled away the afternoon and booked an early evening visit to the Volcán Arenal National Park with Eduardo, one of the Lodge guides. Eduardo drove us to the Park an hour before sundown. He stopped en route to point out an Orange-chinned Parakeet at the top of its nest tree. Four Keel-billed Toucans flew over whilst we watched and we got good scope views when one perched. A little further down the rocky road six WHITE-THROATED MAGPIE-JAYS were sat on a fence. Arriving at the Park’s reception we headed out up the hill avoiding the many columns of Leaf-cutting Ants which crossed the paths in columns. We stopped several times, for us to draw breath and for Eduardo to give us a history of the park. He explained that on July 29th 1968 at about 7:30am a powerful eruption took place and destroyed the west flank of the volcano. Three additional craters were formed. The town of Tabacón was buried, killing 78 people. We were now standing 200 feet above the buried town. Orchids now festooned the area as a living memorial to the town lost. He then marched us up to the top of the hill, these mountain men are very fit and we weren’t, but the view from the top was fabulous, all overshadowed by the now silent volcano. 50+ Cattle Egrets flew to roost as the sun began to set. We carefully picked our way back down to the car park. Then Eduardo took us to a small pond where he showed us a Red-eyed Tree Frog. On the drive back up to the Lodge four COMMON PAURAQUES, a Nightjar species, were picked up in the headlights sitting on the road, only flying off at the last minute. As we walked to the restaurant for dinner the trees were winking with the lights of Fireflies. It rained hard until 10am so although I was up around 5am as usual I just birded the feeders from our sheltered balcony. All the usual species were seen but a pair of the rather plain PALM TANAGERS were new. Seven Neotropic Cormorants flew over, a bit odd this far inland, and a White-tipped Dove was new for the holiday. I walked ‘La Hormiga’ trail in the grounds of the lodge after breakfast but the rain kept coming. Despite the weather this was a good move, I had three lifers in a short space of time. The first was a GRAY HAWK, calling in the canopy but only showing in flight. Then I found a singing male SCALE-CRESTED PYGMY TYRANT whilst I sheltered under one of the trail’s purpose built rain shelters. The third was a WHITE-BREASTED WOOD-WREN, which was moving low through the undergrowth with a Grey-breasted Wood-Wren, which I was pleased to see as it was better views than I had had of this species at Monteverde last year, and a Wedge-billed Woodcreeper was also new for the holiday. I returned to the room as the rain had stopped. Bridgette had done it again seeing an Golden-olive Woodpecker at the feeders, another one I was destined to miss. We got ourselves organised, booked a trip to Arenal Hanging Bridges and went for lunch. After lunch our taxi arrived and took us to the Hanging Bridges, we arranged for him to pick us up at 5pm, as we didn’t particularly want to do the rocky road in the dark. The hanging bridges are located along 3kms of trails through primary rainforest, many of them at canopy level, which brings you closer to the wildlife. Thankfully all of the old bridges have been replaced with metal bridges, as you can see from the photo the old bridges are very Indiana Jones. When we arrived a pair of Rufous-crowned Sparrows were bathing in the guttering of the café. As soon as we started to ascend the trail, as with all forests we could hear birds but seeing them was another matter. Our first job was to let a noisy party of thirty or so people go past us and wait till they had faded away. Eventually we started to see birds with some patience. Two pairs of Tawny-capped Euphonias showed well but were impossible to photograph. Then I saw a male Black-and-yellow Tanager above the first waterfall and soon after we found a small feeding flock in a Ficus tree. A male SHINING HONEYCREEPER was a lifer, and kept company with a male Green Honeycreeper. Then as we crossed the next bridge we had nice close views of two White-faced Capuchins. The other side of the bridge a pair of BLUE DACNIS (also known as Turquoise Honeycreeper) were added to the honeycreepers seen, the male a stunning electric blue. A RUSSET ANTSHRIKE showed on and off in the branches below the bridge. A little further along the path we heard the tell-tale firecracker “wing-cracking” display of White-collared Manakins. This time we were able to see them with comparative ease and managed to take photographs and some film, although I stupidly deleted a bit of display film in error when trying to edit without glasses on. Very cross! Video I did save here. At this point the jungle bugs began to bite and time was flying so we took the shorter route back to the centre. Gathering storm clouds were rolling across the face of the volcano, but we still managed to see more birds before the rain started. A WHITE-COLLARED SEEDEATER showed well in a bush just below the viewing platform. Orange-chinned Parakeets and a Crimson-collared Tanager showed well and two Grey-headed Chachalacas and a Yellow-faced Grassquit were new for the holiday. The taxi arrived on time as promised and took us back to the Lodge. After dinner the rain had stopped and we took a torchlit walk around the grounds, eventually gaining good views of a Common Pauraque, after tracking its distinctive call. We also saw a few large moths including these two, if anyone can i/d the second we would be grateful. I think the first one is Hemileucine Giant Silkmoth Pseudodirphia menander. Today we were on the move again down to Punta Leona on the Pacific coast where we had spent a week last year. This would give us a new set of birds and fill in some of the gaps from last year. It was raining again when I got up but I was determined to make the most of our last morning here so I set off into the grounds. Despite the rain there were lots of birds around. The first good bird was a stunning male Wilson’s Warbler. Then I found the first of two BAND-BACKED WRENS in bushes in the garden. Other good birds around included a male Black-cowled Oriole, a pair of Golden-hooded Tanagers, a pair of Blue Dacnis, a pair of Shining Honeycreepers, a FIERY-THROATED HUMMINGBIRD was a lifer and a White-necked Jacobin was also feeding on the flowers. A White-nosed Coati wandered through. I headed down the El Saino trail which was a little more sheltered, but unlike England at least the rain was warm. On the forest floor here was a Wood Thrush, two BLACK-HEADED NIGHTINGALE THRUSHES and an Orange-billed Sparrow, which was new for the trip. I returned for breakfast and packing. Two Baltimore Orioles were around the feeders as was a gorgeous male Green Honeycreeper. The rain continued to pour down but the birds were unperturbed, a male Yellow -throated Euphonia, a finch species, flew in, a LINEATED WOODPECKER was in the treetops outside the room and a female BLACK-CROWNED TITYRA appeared, the latter two being lifers. 50+ White-collared Swifts were up in the mist and two Red-lored Parrots flew down the valley. It was at this point I caught sight of Randall Ortega on the viewing deck, he had guided us last year, we went down and he greeted us like long-lost friends. He soon wiped the smile off my face when he said just moments earlier there had been an Ornate Hawk-Eagle up amongst the swifts and we had missed it. Unfortunately Randall had just arrived and we were just leaving so there was no opportunity to bird together this time, however he gave us some tips for Punta Leona. Bridgette and I left for a final walk around the grounds. We tagged on to a group with a bird guide briefly and had good views of three Crested Guans, a Grey-headed Chachalaca and a pair of SCARLET-THIGHED DACNIS were yet another lifer from the honeycreeper family. The guide gave us a tip where to find one of my top most wanted birds and just a 100 yards away. On the lawn just below some of the cabins was a female GREAT CURASSOW out in the open and showing really well. In my haste to get a good shot I managed to slip down a steep grassy bank and bruise my arm, but I didn’t care, this was a bird I’d wanted to see since I’d read about them in one of Gerald Durrell’s novels as a kid. With this final flourish we met our taxi at 1pm and set off for the Pacific coast. Apart from two White-throated Magpie-Jays along the rocky road the journey was uneventful and as we descended from the mountains towards the Pacific coast the weather got more sunnier and hotter. After a couple of hours we’ve arrived at the familiar gates of Punta Leona. Seven Muscovy Ducks were on the pond on the left of the entrance drive. We checked in with ease and were ferried to our chalet then went for a walk before dinner. We saw a few new species for the holiday list including eight Scarlet Macaws, a Rufous-naped Wren, a Yellow-headed Caracara, two Variegated Squirrels and a Raccoon lounged in the fork of a tree by the swimming pool. On the return to our chalet after dinner a Lesser Nighthawk was flitting around and calling, a GLADIATOR TREE FROG was on our chalet wall and I found a GIANT BROWN CRICKET. Today was going to be a full-on birding morning from dawn to lunch. 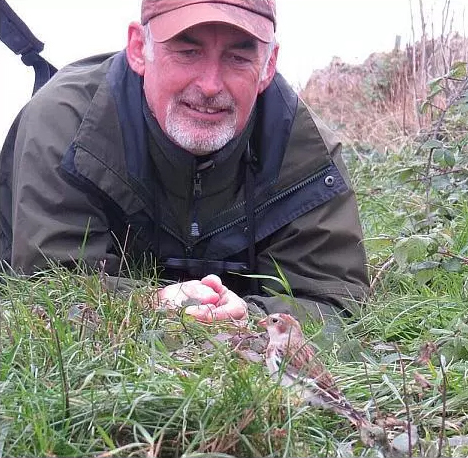 We had booked Patrick O’Donnell after seeing him recommended on BirdForum. We were up early and had managed to get a lift down the very long drive on the employees bus for night shift workers going home. We saw ten Scarlet Macaws on our walk to the bus stop and four Muscovy Ducks were still on the driveway pond. Patrick turned up to pick us up at 6:30am as promised. He was very personable and obviously passionate about birds and we hit it off immediately. Because our destination, Carara National Park wasn’t open yet we first spent a bit of time around the gate lodge to see what was about. A mixed gathering of hirundines included two Barn Swallows and a Grey-breasted Martin, both new for the holiday. A raptor, perched and calling loudly, was found and scoped by Patrick. It was a Grey Hawk and we had excellent views, much better than at Arenal. Also Inca Dove, a pair of Blue-black Grassquits, a White Ibis and a pair of Rose-throated Becards were new for the holiday here. Just before we left five WHITE-CROWNED PARROTS flew over and landed in trees the other side of the road, the first lifer of the day. As we left 10+ Bronzed Cowbirds, also new for the holiday, were on a roadside verge. We stopped on the way in Tárcoles where a Common Black Hawk (Mangrove ssp) showed well and the first Orange-fronted Parakeets of the holiday were in trees near the school. Arriving in the car park at Carara there were already many birds in the surrounding trees, the first two were lifers, a PIRATIC FLYCATCHER and a SCRUB EUPHONIA and also new for the holiday a Streak-headed Woodcreeper and a Boat-billed Flycatcher. Patrick heard a STRIPED CUCKOO near the main road and we managed to get views of it. Three lifers before we had even entered the forest! As soon as we entered the forest itself lifer followed lifer, plus lots of new holiday birds and some other cool wildlife too. In almost the first tree we came to there were three flycatchers and a vireo, two of which were lifers, there was Yellow-bellied Flycatcher, YELLOW-OLIVE FLYCATCHER, Great Crested Flycatcher and YELLOW-GREEN VIREO. A pair of Scarlet Macaws flew ahead of us calling raucously. In the sky through a hole in the canopy we could see a Cliff Swallow, two LESSER SWALLOW-TAILED SWIFTS and 12+ COSTA RICAN SWIFTS. Moving on we added Dusky-capped Flycatcher and Stub-tailed Spadebill to our ever-growing list. Then Patrick pointed out a pair of CHESTNUT-BACKED ANTBIRDS, the first of seven, on the forest floor, they proved very difficult to photograph although Bridgette managed one shot below. Then I found a Green-and-Black Poison Dart Frog on the forest floor. We rounded a corner in the trail and there was a loud crashing coming through the undergrowth, we wondered what was coming but in the event it wasn’t the large mammal it sounded like, a pair of Golden Agoutis bounded across the path in front of us and kept going. Agoutis are like giant Guinea Pigs. Patrick was a wonderful guide and knew every call we heard, in the end I said if we can’t see it don’t tell me please, because I hate birds on my World List as heard only. In the end the only two species we heard at Carara, which remained unseen at the end of the holiday, was BUFF-THROATED FOLIAGE GLEANER and LONG-BILLED GNATWREN. Then we hit a little purple patch during Patrick pointed out a GOLDEN-CROWNED SPADEBILL, two DOT-WINGED ANTWRENS, a Black-hooded Antshrike, two PLAIN XENOPS and 2+ NORTHERN BENTBILLS. Then we had a pair of BLUE-BLACK GROSBEAKS and I spotted a Ruddy Quail-Dove in the leaf litter. A LONG-BILLED HERMIT and a Bronzy Hermit sped around a flowered bush, both are hummers. Then I chipped in with my best find of the day, a NORTHERN ROYAL FLYCATCHER, a much-wanted species, it would have been great if it had raised its crest, but that is rarely seen. The birds just kept coming, when I was here with Bridgette and Michael last year we saw nowhere near this amount of species. Just shows what a difference a good guide makes. The next rush of species included a TAWNY-CROWNED GREENLET, a LONG-TAILED WOODCREEPER, a RUFOUS-BREASTED WREN, a Rufous-and-white Wren, a Riverside Wren, a SLATE-HEADED TODY-FLYCATCHER, a COCOA WOODCREEPER, a PURPLE-CROWNED FAIRY, another hummer and I was pleased to find a male KENTUCKY WARBLER. Also here was a huge OWL BUTTERFLY and a Blue Morpho. We came to a clearing where there was a huge fallen tree and paused for a rest. On the tree was a large Green Iguana. Around the clearing was a Philadelphia Vireo, a pair of BLACK-THROATED TROGONS, a Northern Waterthrush, a GRAY-CHESTED DOVE and a gorgeous male Painted Bunting. We passed the river where there was a Spotted Sandpiper and a Green Kingfisher. An OCHRE-BELLIED FLYCATCHER was calling but we didn’t see it, although I saw one at Punta Leona later. A female DUSKY ANTBIRD showed well and a TROPICAL PARULA was high overhead in a tall tree. We crossed the river again and saw two Muscovy Ducks, really nice seeing wild ones in a forest setting. A White-whiskered Puffbird was sat by the path and a BLACK-FACED ANTTHRUSH was foraging in the leaf litter close by. A Turquoise-browed Motmot and a Streaked Flycatcher were the final new holiday birds as we walked to the car park. Patrick drove us back to Punta Leona and we said our goodbyes, we would thoroughly recommend him to any visiting birder. After such a long hectic morning we took a long lazy lunch, had a swim and went for a wander around the grounds and along the beach. We saw both Black Iguanas and Green Iguanas and well as a Common Basilisk. Plenty of birds around as usual including a female Rose-throated Becard, eight Magnificent Frigatebirds and 30+ Brown Pelicans offshore, a Northern Waterthrush and six Scarlet Macaws. We saw the Lesser Nighthawk again in the evening. I got up early and wandered down to the forest before breakfast. The dawn chorus was spectacular and loud. Best bird was an OCHRE-BELLIED FLYCATCHER which I had only heard yesterday. An ORANGE-COLLARED MANAKIN was performing exactly the same wing-cracking display as the White-collared Manakins we had seen at Mawamba and Arenal, but try as I might I couldn’t get a view. A male Blue-black Grosbeak was notable, as was a Chestnut-mandibled Toucan, four Scarlet Macaws and a Squirrel Cuckoo. After breakfast we had booked a taxi to take us up to the top of the Villa Lapas as Randall had said that we could get King Vulture and White Hawk there. In the event we didn’t see either but we did see raptors and had a lifer too. It was fiercely hot up there but we decided to walk up to gardens at the top. Notable birds included two Chestnut-mandibled Toucans, a Rufous-capped Warbler, 3+ Zone-tailed Hawks, 10+ Black Vultures, 4+ Turkey Vultures, five Wood Storks, a Groove-billed Ani, two male CHERRIE’S TANAGERS were a lifers, two pairs of Scarlet Macaws and three White-collared Swifts. We also saw a large unidentified raptor with a dark eye mask and long pale legs carrying a large iguana down the valley (in hindsight having seen one since in Belize, this was probably Laughing Falcon) and a Tropical Pewee. The taxi driver picked us up at midday to go back to Punta Leona. In the afternoon we had booked to go on the Mangrove Birding Tour on a boat out of Tárcoles. Our transfer turned up like clockwork at 2pm and took us to the dock. We had done this trip last year and it had been excellent. This year there seemed to be fewer birds and the water levels were very high. At the dock we had a Mangrove Warbler, this is a subspecies of Yellow Warbler and has a rufous crown and unsurprisingly is found in the mangroves. Also a Rufous-browed Peppershrike was singing and not showing, but we had seen one last year anyway. We boarded the boat and started to see all the regular waterbirds. 20+ Laughing Gulls, 30+ Red-winged Blackbirds and a male Belted Kingfisher were Costa Rica ticks. Seven Boat-billed Herons were new for the trip and Ospreys showed outstandingly well. In the mangroves we saw many Crabs (not sure what species), a stunning male Prothonotary Warbler and a scarce Panama Flycatcher. A pair of Green Kingfishers showed well and an Amazon Kingfisher and three juvenile Yellow-crowned Night Herons on a nest were new for the trip. We moved on to a flat area where the waders are usually found and we weren’t disappointed as there were a pair of Southern Lapwings, video here, a pair of Double-striped Thick-Knees, 12 Least Sandpipers and best of all a COLLARED PLOVER, which was a much wanted lifer, missed last year. A huge American Crocodile was seen on the return to the dock and a YELLOW-NAPED PARROT flew over. For the last time I headed out to the forest pre-dawn, a large FRUIT BAT species was flying above the canopy. I had decided to take the long walk to the beginning of the drive to photograph the Muscovy Ducks, naturally when I got there they had gone and only a Spotted Sandpiper remained. I saw at least three Blue-crowned Motmots on the walk down giving their mournful owl-like hoots. A Pale-billed Woodpecker showed really well and I found a SOUTHERN BEARDLESS TYRANNULET, another of the difficult flycatchers. After much perseverance I managed to get views of a displaying male ORANGE-COLLARED MANAKIN. I also saw six Chestnut-backed Antbirds, a Black-hooded Antshrike and a Turquoise-browed Motmot. On the river leading to the “pond”, which wasn’t really a pond just a widening of the river, I saw five ROSEATE SPOONBILLS, 20 White Ibises, five Cattle Egrets, five Snowy Egrets and a Great Egret. On the return walk notable birds included two Fiery-billed Araçaris, a Great Tinamou was in the middle of the drive, a Mealy Parrot called raucously from an overhanging branch, a White-whisked Puffbird and a Hoffmann’s Woodpecker defended its nest hole valiantly from a pair of marauding Scarlet Macaws intent on stealing the contents. As I got back near our chalet I saw two Crimson-fronted Parakeets. After breakfast Bridgette and I walked the Gigantes trail in the forest. We saw the only Melodious Blackbird of the holiday on the walk there. The trail was quiet but we did find a small troop of 4+ White-faced Capuchins. Whilst Bridgette tried to take photos I walked on and a snake sp shot across the trail past my legs and down the bank. With what I saw of it I think it may have been a Forest Racer, but I didn’t follow it to check. Whilst we were checking out some interesting fungi I found a Ruddy Quail-Dove creeping around nearby. In a sunlit clearing there was a Philadelphia Vireo and a Long-billed Hermit. We returned to the chalet and packed our cases ready for the transfer to Hotel Orquideas in San José to spend the night before our flight home. As we walked down to reception to pick up our transfer there were 30+ Magnificent Frigatebirds filling the sky above. The transfer was uneventful and chance for a snooze in the heat. Our driver didn’t offer the Orotina owl stop this year though. We saw 50+ Black-bellied Whistling Ducks near the river at Tárcoles and a Squirrel Cuckoo was at Turricares. We checked into Hotel Orquideas and were given Room 29, this one the only one in the place with a private 30ft long balcony (29 must be lucky). After resting up we went for a walk around the grounds and private nature reserve to see what we could find. Unfortunately the hotel’s dog attached itself to us and was great at scaring everything, so we split up and Bridgette led it away. Many of the commoner species were seen but two OLIVE SPARROWS were lifers and also notable was a Paltry Tyrannulet and a Southern Beardless Tyrannulet. We returned to soak up the sun and watch the skies. A pair of Blue-and-white Swallows were nesting on the hotel. Many Black Vultures were in the skies and a Peregrine went over, a Costa Rica tick. I also had an unidentified raptor sp very high, which may have been Short-tailed Hawk but open to ideas, photo below. After dusk two small Bats flittered around our balcony. Another gorgeous hot and sunny day dawned and I was out for my final pre-breakfast walk. Best birds were a pair of Yellow-green Vireos and a Blue-crowned Motmot. From the balcony I had a Broad-winged Hawk over the final new bird of the holiday and I saw the Peregrine again. Then it was off to the airport for the long way home following a brilliant holiday with nearly 300 species of bird seen and lots of other great wildlife. If you want a full species list or further information contact me at the usual address. It’s not really necessary to take a scope unless you are planning on seawatching or want to be digiscoping. It’s an encumbrance, it’s way too hot and sticky to be carrying it around and if you hire a guide he/she will have one anyway. It’s also not very useful in the forests. Take all of your electronics out of your bag when you go through U.S. Customs, because they’ll make you do it anyway. All of the hotels/lodges we were in did not have plugs in the sinks, take your own or improvise as we did with the free shampoo bottles, which just fitted. Carara National Park does not take Credit/Debit cards but cash only, don’t get caught out. There are no refreshments here either, but you can drink the water. Most places will advise you that you can drink the tap water, we did and had no problems, but if they don’t tell you it’s safe, ask. We tipped all of our drivers and hotel staff, for which they were very grateful. Always carry water, it gets very hot and it’s easy to get dehydrated. If you are in San José it is best not to wander around with your bins around your neck and keep your valuables very safe as pickpocketing is a problem here. If you are booking a Tarcoles river boat tour, make sure you are booked on a birding tour and not the tourists Crocodile boats. Also try and book with Randall Ortega, a top guide, a birder’s birder. In the Cloud Forest be prepared for rain with waterproofs, although it will remain warm, and you may prefer getting wet as I did, to sweating inside wet weather gear. If you go off track beware of the possibility of snakes and more likely stumbling into one of the many Army Ant trails, which can get painful quickly. If you go on a Night Walk avoid putting your hands on handrails in the dark, you never know what might be sat there. You have to pay an exit tax at San José Airport before you can check in for your flight, there is a desk just inside the main doors. It is currently $26 USD each.